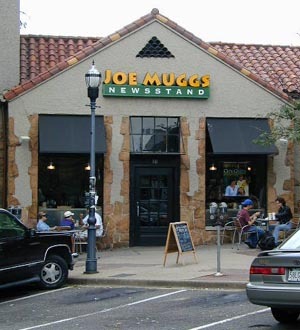 Five Points() Five Points Joe Muggs employee Katie Swinton admits to being a regular customer at the new Starbucks across the street. "I work around gourmet coffee all day at Joe Muggs," said Swinton. "From Sumatran to Kona to Tanzanian Peaberry, but none of them have that complex mix of flavors I get from Starbucks' Encanta blend." According to Swinton, she has always been a Starbucks fan, but found the Joe Muggs location just too convenient. "I was excited when Joe Muggs opened last year because it is so close to my place on 13th Avenue South," said Swinton. "I figured I could work there and get free coffee before my classes." Swinton is a UAB Drama student and says she needs a lot of caffeine before a performance. But ever since the Starbucks opened across the street, Swinton has been spending a lot of her Joe Muggs money at the Seattle based chain. "I used to get a low foam Latte and a Rice Krispy Treat at Joe Muggs before class everyday," said Swinton. "But now I either get a Latte or a Tazoberry at Starbucks depending on how hot it is outside." When asked why she didn't just get a job at Starbucks instead of Joe Muggs, Swinton was unequivocal. "I definitely would not want to work there. They have some really crazy rules, like you have to count the Java Jackets® at the end of each shift. But I tell you, that Rasberry Mocha Chip is sinfully delicious." Swinton is unsure what she will do when Starbucks eventually puts Joe Muggs out of business. "I guess I could work at Starbucks," said Swinton. "But I wouldn't enjoy it." Airport Heights() Airport area residents are fighting back against what they view as an out of control airport authority that cares little for the neighborhoods it continues to destroy. Rather than attempt to stop further airport expansion, Inglenook residents plan to open their own airport to compete with Birmingham International Airport. Southwest airlines has already agreed to use the new ten thousand foot runway to be constructed on Birmingham Street. According to the airline, they will be able to cut fares as much as fifty dollars by flying into the new airport. Inglenook airport spokesperson Chandra Hall explains why the new airport will be more efficient for passengers and airlines, and be cheaper to operate. "We plan to do a lot of it ourselves," said Hall. "The community has really come together behind the idea as a way to create jobs and improve the quality of life in the area." That improved quality of life will come in part from the new airport's operating hours. No aircraft will take off or land between 10 PM and 7 AM, and there will be no flights on Sunday. "But we will have much more to offer the airlines and passengers," said Hall. "We will be a truly international airport unlike Birmingham. The U.S. Customs Department plans to locate its next immigration control station at our airport. Our first non-stop international flight will be the Inglenook-Morocco route." Taking the best ideas from airports around the world, the international terminal will include duty free stores, money changers, English speaking employees, and free luggage carts. In order to provide jobs for the community, a school has been set up in Zion City that will train flight attendants, ground crew, and air traffic controllers. "And our airport is not going to be an eyesore," said Hall. 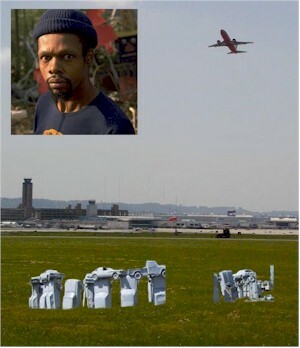 "We have hired [former Airport Heights resident] Lonnie Holley to come back and do some sculptures to place near our runway. He will also decorate the main terminal with murals and permanent installations." The luggage tag for the new airport will be IGK which fits just between Izmir, Turkey (IGI) and Kingman, Arizona (IGM). Service to the new airport is expected to start by the end of the year. Downtown() In a nod to Birmingham's increasingly diverse population, The Birmingham News will begin a new section starting with this Wednesday's edition. 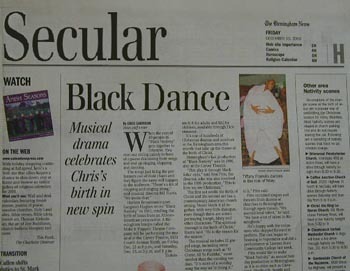 The Secular section will include happenings in the Birmingham area that have nothing to do with religion. Publisher Victor Hanson II of the Hanson family stresses that this will not take the place of the popular Religion section. "We are simply adding a new dimension to the paper that better reflects our market," said Hanson. "We are not advocating Secularism by any means." The first printing of the Secular section includes an article about author Tom Wolfe, and a column on cool web sites. Regular features include an events section that will keep readers on top of the goings on at Naked Art Gallery and The Garage. The Hanson family also plans to hire a sports writer for the secular section. "We are looking for someone who can write about sports in Alabama without invoking the name of God or The Bear," said Hanson. "We also want someone who has experience writing about non-religious sports like soccer and tennis." A secular music writer has already been hired to cover all of the concerts at Sloss Furnaces and The Nick. "Phillip Sanders is kind of like a cross between Shawn Ryan and Dennis Washburn," said Hanson. "Two people we never should have fired." The 'Hamster sent several staffers into the field to gauge public reaction to the Secular section. Members of the Tuesday night singles group at the Unitarian Church on Cahaba Road were excited about the new section. "Everything doesn't have to be about religion," said Jamie Hunt. "Although there is nothing wrong with God if that's what you believe. Or if you don't, that's ok too." The Secular section appears well on its way to becoming a Birmingham fixture.